The film itself was produced by Inco as an aid to the understanding of some of the electrochemical processes that result in corrosion. It was felt that ad knowledge of these principles would improve the basis for action in avoiding corrosion by choosing the proper materials and using them to best advantage. As stated in the final paragraph, the goal is to have the right metal used in the right way in the right place. It is hoped that making the substance of the film available for ready reference in this form will prove to be a useful supplement to the motion picture itself in achieving this objective. In nature the forces that cause corrosion are as constantly in action as the sea. Everyone has seen corrosion turn useful structures into crumbling skeletons, productive machines into frozen hulks, automobiles into piles of junk. It costs more than 6 billion dollars in a year. It dissipates our resources and the fruits of our labor. It interrupts production. It causes accidents. Different metals are affected to different degrees and corrosive attack takes many different forms. Attack may be by general tarnishing or rusting with occasional perforations in especially affected areas (1). Corrosion may develop preferentially near the junction of two different metals (2). The metal may suffer highly localized attack by pitting (3). The strength of a metal may be destroyed by cracking induced by corrosion (4). We are all too familiar with corrosion r in action in these ways. Corrosion may also be confined to crevices, under gaskets or washers, or in sockets (5). It may have the effect of removing one of the constituents of an alloy so as to leave a weak residue (6). The study of corrosion considers reactions between a metal and its environment (7). It also concerns the suppression of corrosion by changing the characteristics of metals and their environments. The great progress in the battle against corrosion has been based on a better understanding of the natural forces concerned and on the development of the scientific principles upon which effective control of corrosion must be based. It is possible to explain how this action occurs and what can be done to reduce it by illustrating some of these principles. To show the existence and location of anodes and cathodes in corrosion processes. Prepare 250 ml. 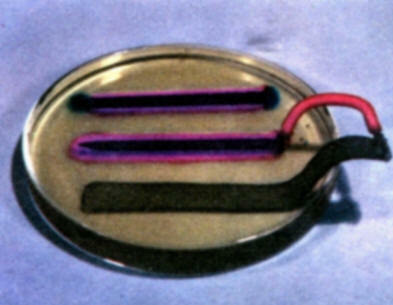 agar agar gel containing 3% sodium chloride. To do this, dissolve 7.5 g sodium chloride in 250 ml. distilled water. Add 5 g powdered agar agar and boil the mixture until the agar is dispersed. Then add 5 ml of the potassium ferricyanide solution and 1 ml. of the phenolphthalein solution. To demonstrate the accumulation of alkali at cathode areas and corrosion at anode areas, fill a Petri dish with the hot gel solution and allow to cool without disturbance until it begins to set. At this point place one of the partially copper plated nails in the gel and observe the subsequent color developments over a period of several hours. The red color develops along the copper surface because it is performing as a cathode and the blue color develops on the bare iron surface that is the anode in the copper-iron galvanic couple. 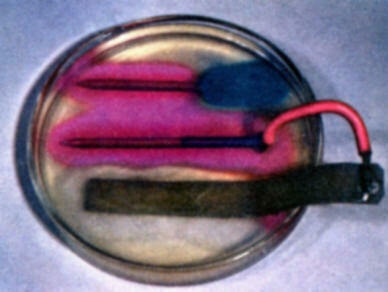 The red color results from the accumulation of alkali on cathode areas and the blue color reveals the presence of ferrous ions at the iron anode surface. Save for comparison with experiment (f). 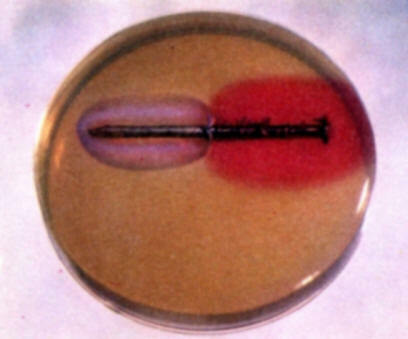 Repeat experiment (b) using a nail that is partially plated with zinc. Note the color development over several hours. In this instance no blue coloration appears because zinc is more active than iron and performs as the anode in the zinc-iron galvanic couple. Zinc ions form at the anode but they do not form a colored compound with the indicators used. Hence, no color develops on the zinc area. 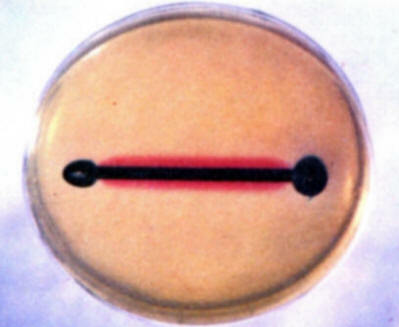 To demonstrate the existence of and to locate anodes and cathodes on a single metal surface, repeat experiment (b) using a plain bare iron nail. Note the development of blue and red colors at different places on the nail. (Most frequently the blue color develops on the cold worked head and point while the red develops on the shank.) Save for comparison with the results in experiment (e). To demonstrate the role of galvanic anodes in cathodic protection, solder a wire connection onto the head of a bare iron nail and clip a second wire on a strip of zinc. Bend the zinc strip so that it will rest in a Petri dish without support. Connect the nail and strip of zinc to a milliammeter. Then pour warm gel solution into a Petri dish and allow to cool as in experiment (b). As the gel begins to set, place the nail and zinc strip in the gel. Note that iron is not corroding and forming iron ions. The development of a red color on the iron surface shows that it is now acting entirely as a cathode. 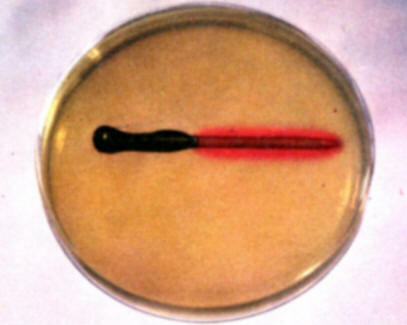 (A local red coloration that may develop on the zinc strip where it comes out of the gel is due to a secondary oxygen concentration cell effect on the zinc. This is to be distinguished from the reactions of the zinc-iron nail galvanic couple. Compare with the results of experiment (d). To demonstrate that galvanic anodes through cathodic protection may also eliminate destructive galvanic corrosion, repeat experiment (e) using a partially copper plated nail in place of the bare iron nail. Compare the results with those of experiment (b). Note again that a red color develops on the nail receiving protection from the sacrificial zinc anode.